The holidays are here and we're feeling all warm and cozy over this beautiful rustic shoot styled by Smitten Events. This festive celebration features a classic Christmas color palette of red, green and gold with rustic textures of pinecones and wreaths all nestled near the fireside nuptials.Don't miss any of the classic christmas details captured by Lindsay Skeans Photography. Check out the rest of these Christmas wedding ideas here. Christmas is hands down our favorite holiday so we wanted to showcase our take on a festive wedding celebration in a classic holiday palette. Red and green at Christmas doesn't need to be boring! When you add in whites, metallics, plaids, checks and lots of texture the traditional holiday colors look elegant and fun. Christmas is the time of year when timeworn family heirlooms take center stage so we layered Grandma's holiday china and silverware with modern pieces to set the sweetheart table. 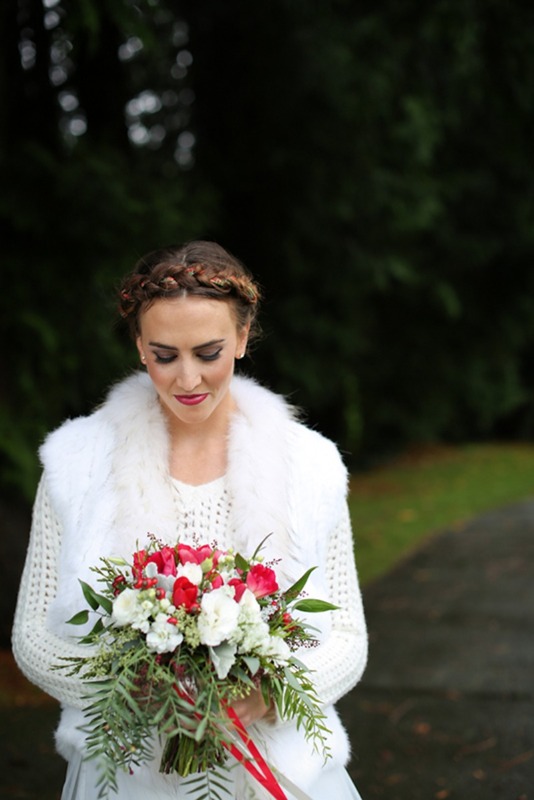 Our favorite details from this shoot included the cake, with its incredible cable knit fondant, and the bridal look. Our venue, The Gleneagles Clubhouse, is a log cabin-style building that provided the perfect backdrop for these cozy, fireside nuptials. In keeping with the theme we paired the bride's tulle ball skirt with a knit sweater and fur vest, perfect for a cozy portrait session. We later traded the sweater for a preppy plaid shirt and borrowed 'his' classic crested blazer.